The body has 3 main balance systems: Vision, somatosensory and vestibular. These systems work together to maintain your balance and to tell your nervous system where you are in space. The somatosenosry system: this provides feedback to your braiin from the skin, joints, tendons and muscles. The Vestibular system: there is a sensitive organ in the inner earwhich responds to movememtns of your head and changes of position. Vision: If you close your eyes you are effectively removing one of the 3 systems, which can expose how well the other systems are working. By practicing balance exercises you will improve the sensitivity of the first two systems. But it is also important to practice balance with your eyes closed. If you are overdependant on your vision to stay balanced this may make you vulnerable to injury if your eyes are engaged in another task. 1. Firstly take off your shoes so that your foot has really good contact with the floor. Your Balance and posture is heavily influenced by the sensory information your foot is constantly sending the brain. For more information on this please read my earlier BLOG about improving your foot connection with the ground. 2. Start simply. You need to feel secure to be able to challenge your systems. 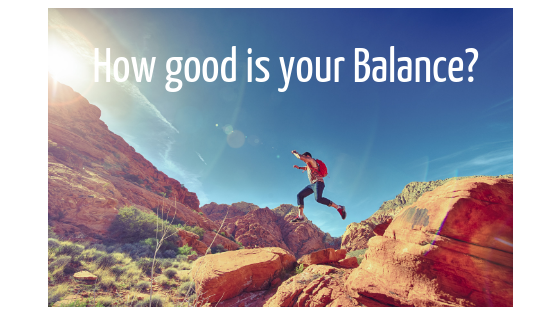 If you feel fearful it is likely to compromise how well you can use all systems to help you balance. 3. You need to practice little and often, daily is best and most simple balance exercises can be incorportated into day to day life. Simple daily tasks can include 1. putting your socks on standing up, 2. when brushing your teeth stand with feet one in front of each other or on one leg. For some fun progressive balance exercises watch this video. It starts off simply and gets progressively more challenging.